CLEMSON, SC – The Clemson women’s soccer team fell to #5 Virginia 1-0 in an excellent defensive performance on Sunday afternoon at Historic Riggs Field. The Tigers dropped to 5-4-2 (0-3 ACC) with the loss, while the Cavaliers improved to 9-1-1 (2-0-1 ACC) with the win. The game was scoreless for over 80 minutes of play, a credit to the Tiger defense. The Cavaliers broke open the scoreless tie at the 80:44 mark when Erica Hollenberg netted a goal from inside the box after receiving a cross from Makenzy Doniak. The goal gave Virginia a 1-0 lead, and ultimately, the victory. 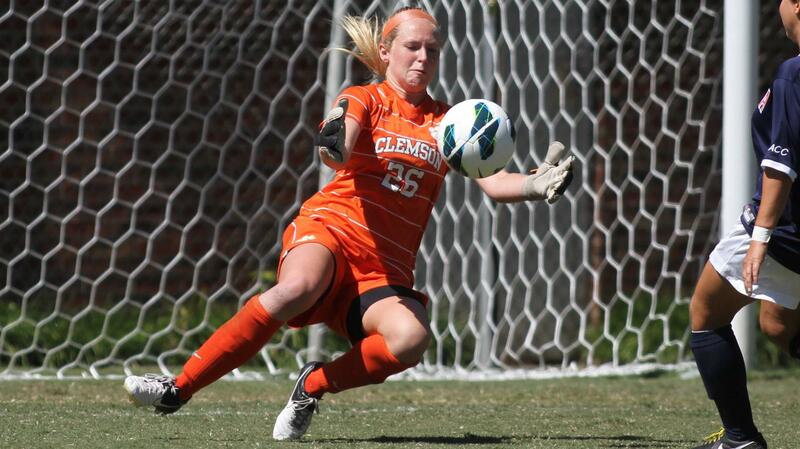 Freshman goalkeeper Hunter Rittgers tallied eight saves in contributing to Clemson’s defensive effort. The nine saves were a career high for the rookie, who now has 41 saves on the season. The Tigers took three shots and did not attempt a corner kick, compared to Virginia’s 16 and seven, respectively. There were five fouls called on Clemson and seven whistled on the Cavaliers in the game. “I am proud of our kids. They executed the game plan perfectly,” said Head Coach Eddie Radwanski. “We were successful in frustrating Virginia and disrupting the way that they typically like to play. We also created three or four significant chances. We did not convert on those chances, and sometimes those are just the breaks of the game. Still, I am extremely proud of the way we competed and battled. This should be a standard for the way we show up every time we are out on the field. Clemson will now hit the road for three consecutive games, all three against teams ranked 13th or better in the nation. The Tigers will face #4 Duke on Thursday, September 27 in Durham, NC and #13 Wake Forest on Sunday, September 30 in Winston-Salem, NC, before traveling to Tallahassee, FL on Thursday, October 4 to take on number-one-ranked Florida State.